On February 16, the US Department of Commerce (DOC) released the reports from its Section 232 investigation, revealing its ruling that imports of steel and aluminum “threaten to impair the national security.” President Trump now has 90 days to decide what action to take. The announcement has already fueled a dramatic surge in steel prices and in US aluminum premiums, and markets will likely remain in turmoil until the President announces a specific plan. The longer term impact will depend heavily on the structure of the restrictions President Trump chooses to enact, but there is a risk of significant price increases for steel and aluminum, higher costs for steel and aluminum-consuming industries, and potentially even shortages of certain metal grades. What did the Department of Commerce recommend? For both steel and aluminum, the DOC has suggested three possible remedies: sweeping tariffs, across-the-board quotas, or a hybrid tariff-quota system targeted at specific countries. According to Commerce Secretary Wilbur Ross, the goal of all the suggested remedies is to boost domestic capacity utilization in both sectors to 80%. Steel currently hovers around 73% utilization, while aluminum sits at 48%. For steel, a quota equal to 63% of all US imports would mean a maximum limit of 22 million metric tonnes. This would be lowest import level since 2010. Similarly, under the terms of the proposed hybrid system, the 53% tariff would impact countries who together supplied 41% of all imported steel last year. Brazil and South Korea, in particular, are the second and third largest suppliers of steel to the US. For aluminum, under the proposed hybrid system, the 23.6% tariff would target suppliers who comprised 23% of imports by value in 2017. Notably, the targeted tariff would not include Canada, by far the largest supplier of aluminum to the US. Domestic steel suppliers have been clamoring for import restrictions since the Section 232 probe was initiated last year, and the recent announcements have emboldened mills to push through dramatic price increases. Steel prices began climbing as the deadline for the Section 232 deadline approached, and have surged even further since the DOC confirmed a national security threat. 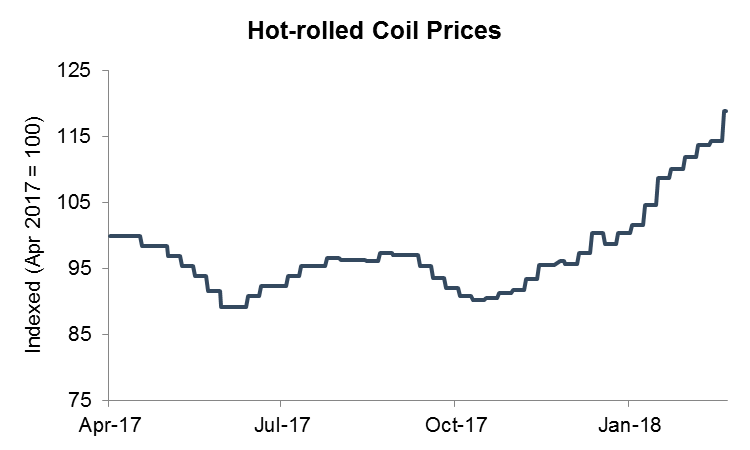 The American Metals Market hot-rolled coil assessment has risen 14% since the DOC first announced it had completed its investigation, and now stands at its highest point in years. 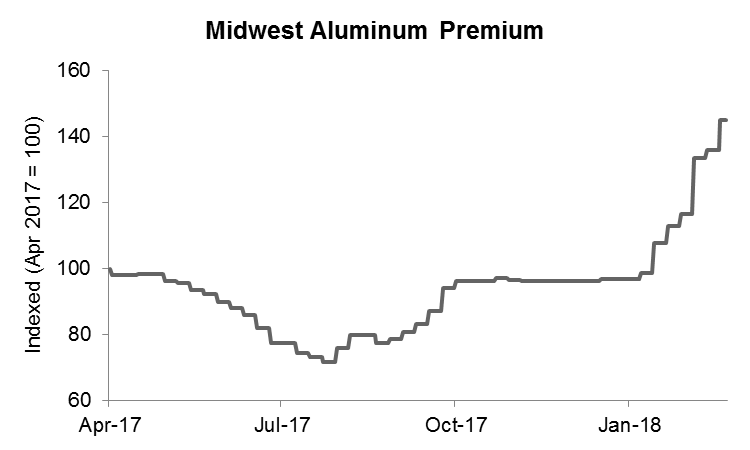 The Midwest aluminum premium, which measures costs for delivery of aluminum in the US has shot up nearly 50% since the start of the year. This has helped offset the effect of weakening global aluminum prices. What action is the President likely to take? Protectionism has been a key campaign issue for the Trump administration, leading many industry observers to expect that the President will impose severe restrictions based on the DOC’s recommendations. However, despite this strong rhetoric, several factors could complicate the President’s decision. Similar protectionist initiatives in the last year have fizzled out. In January 2017, President Trump issued an executive order mandating the use of American steel in all new pipelines. The order spurred a temporary spike in prices for steel plate and line pipe, as buyers scrambled to ensure they would have sufficient supplies for midstream projects. Despite all this fanfare, the DOC ultimately missed the July 23 deadline to release an implementation plan, and the administration has yet to take any other action related to the order. Section 232 has met with significant pushback from other domestic industries. Key metal-consuming industries, such as the automotive sector, have argued against Section 232 trade remedies, worried that new import restrictions would significantly raise their input costs. Even some steel suppliers, who import intermediate steel materials to manufacture finished products, have criticized Section 232. Other industries, such as agriculture, have expressed concerns that they would be harmed by retaliatory trade measures that could be imposed in response to any Section 232 actions. Collectively, these sectors may wield more clout than steel and aluminum makers. The President may have trouble mustering political support for Section 232 actions, even from within his own party or administration. During his meeting with the Congressional Steel Caucus, President Trump met with significant backlash from lawmakers from both parties, who raised concerns about retaliatory trade policies and increased costs for US manufacturers. Similarly, Secretary of Defense James Mattis submitted a memo to the DOC indicating that, while his department agrees that unfair trade practices could pose a threat, it “continues to be concerned about the negative impact on our key allies.” He also urged the President to lean toward “targeted” tariffs rather than sweeping global remedies, and suggested waiting to act on aluminum. Imposing tariffs or quotas runs the risk of inviting severe retaliation from a broad array of countries, many of whom are key US allies. The head of the European Steel Association, for example, stated that “we would expect swift and vigorous counter action by the EU […] including necessary safeguard measures mirroring the product scope and types of any US Section 232 trade measures.” As the US is not a particularly large exporter of steel or aluminum, retaliatory measures would likely target other, more significant exports, such as agricultural products. Countries could also raise a challenge to Section 232 actions with the World Trade Organization. These challenges should give the administration pause before moving forward with sweeping import restrictions. The DOC’s Section 232 ruling is fairly unprecedented, but there may be one historical example that could provide a guide in what to expect. In 2002, the Bush administration imposed Section 201 tariffs on steel imports, leading hot-rolled coil prices to spike by 63% within three months. In response, the European Union, Brazil, China, Japan, South Korea, New Zealand, Norway, and Switzerland filed complaints with the World Trade Organization, which ruled that the US tariffs were illegal, allowing countries to impose sanctions. The European Union also threatened to levy tariffs worth $2.2 billion on a broad array of US goods. The Bush administration ultimately repealed the tariffs in December, despite having originally planned to maintain them through 2005. What do we expect the final restrictions to look like? Given his campaign’s focus on protectionism, it is probable that President Trump will pursue some type of action. However, this will likely take the form of more limited remedies, rather than global tariffs or quotas. Secretary Ross himself stated that “232 doesn’t have to mean the same tariff on every single country. It doesn’t have to mean the same tariff on every single product.” We expect restrictions to focus on a specific subset of countries and to target particular products. How will this impact your costs? The magnitude of the impact on prices will depend on which countries are targeted. China, for instance, has been the focus of the Trump administration’s most vehement rhetoric, but currently comprises only 2% of total steel imports, down from 7% in 2014. The country is already subject to 29 antidumping and countervailing duty orders on steel. Similarly, China is already the target of an existing aluminum duty, and represented only a 15% share of aluminum imports last year. New tariffs or quotas on China might therefore have only a minor effect on the domestic market. Exemptions for certain countries or products could also play a key role. Even if the President imposes tariffs or quotas, the DOC itself left open the possibility of allowing exceptions for “economic” reasons or for a “lack of domestic capacity.” These criteria certainly apply for a number of products, such as steel plate, which is currently manufactured by only a handful of US mills. Ultimately, in the short term, we expect that uncertainty about Section 232 will continue to exert upward pressure on prices, until the President makes a firm announcement about what course of action he will pursue. If the selected remedies turn out to be less severe than the DOC’s recommendations, prices could correct downwards. However, if the chosen restrictions do target specific products, the market may see significantly higher prices or even physical shortages of those items. Some industry observers have highlighted very specialized products (such as electrical steel) or those that have been subject to particularly high import levels (such as energy tubulars) as being particularly at risk. Interested in learning more about how Section 232 could impact your costs? Find out how timely, accurate data enhances cost management, supplier relationships & negotiation outcomes.